Buy any dozen, get a second dozen original glazed doughnuts FREE at Krispy Kreme on April 28, 2013. 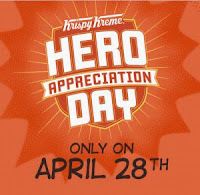 Click the link below to go "like" the Krispy Kreme Doughnuts Facebook page to get your coupon. Once you print your coupon take it to a participating Krispy Kreme location on April 28, 2013.